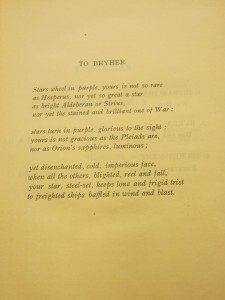 Poet H.D. (a.k.a. 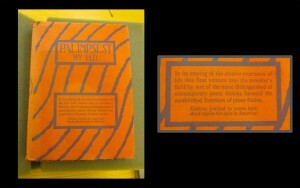 Hilda Doolittle) published her first novel, Palimpsest, in 1926. It’s an eye-catching object—a bright red jacket with wavy blue lines and an inside hard cover decorated with what appear to be gold Egyptian hieroglyphics, or an artist’s rendition of hieroglyphics. 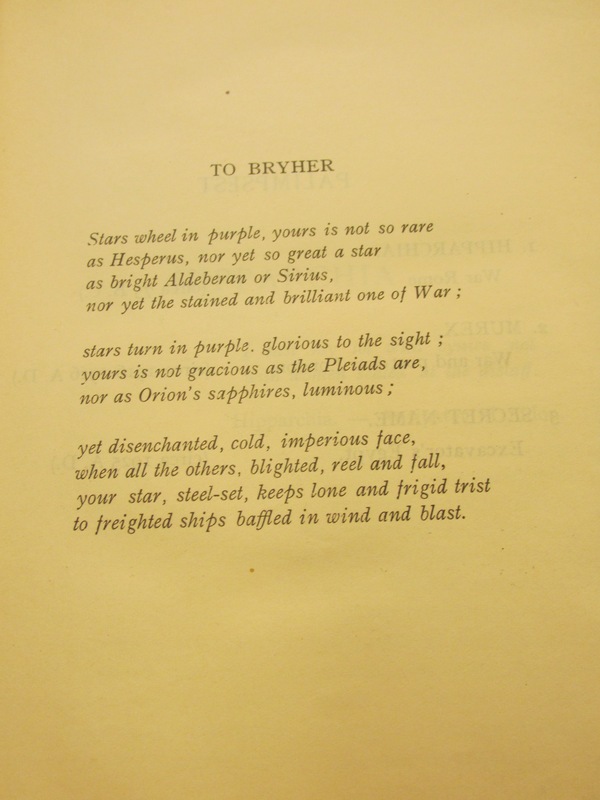 As is indicated on the jacket of the front cover, only 700 initial copies were printed in the expatriate’s home country, the United States, despite her relative success as a modernist poet. 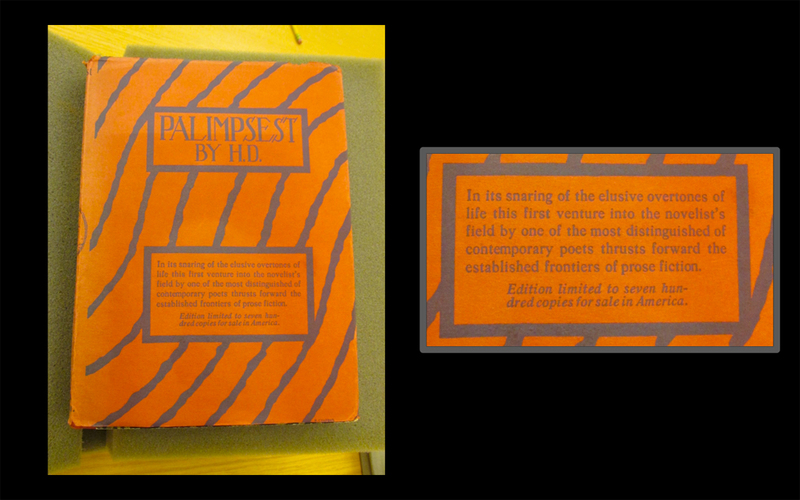 An original copy of Palimpsest, published by Boston’s Houghton-Mifflin Company, can be found in Trinity College’s Watkinson Library in Hartford, Conn., where I viewed it in February 2016. According to the WorldCat research database, as of March 2016, there only 111 of these American editions accounted for in libraries worldwide, with 3 copies available in Connecticut: one at Trinity College, one at Yale University library, and one at the Bridgeport Public Library. It’s immediately obvious that H.D.’s pen name is gender neutral. What is interesting about Palimpsest is that it preserves the ambiguity of H.D.’s gender identity. “In its snaring of the elusive overtones of life this first venture into the novelist’s field by one of the most distinguished of contemporary poets thrusts forward the established frontiers of prose fiction,” touts the front cover of the book, avoiding any gendered pronouns. The inside left jacket flap advertises a reprint of Willa Cather’s My Antonia, referring to the author as “Miss Cather.” The back jacket flap describes Godfrey Elton’s The Testament of Dominic Burleigh, referring to the author more than once as “Mr. Elton.” We see no such mention of H.D. For a bit of local history embedded in Palimpsest, the edition at the Watkinson Library contains a sticker of bookseller Edwin V. Mitchell, who had a store in downtown Hartford at 27 Lewis St., a store which at the time Palimpsest was printed would have been a recently opened business. The Connecticut Historical Society has a digitized collection of scrapbooks put together by local resident Mary Morris, and the June 1920 edition contains photos of Mitchell and information about the opening of his bookstore in 1923 (see page 102 of 189 in the PDF version of the scrapbook). Mitchell’s friend and business partner, James Thrall Soby, joined as a partner in the bookshop in 1929. 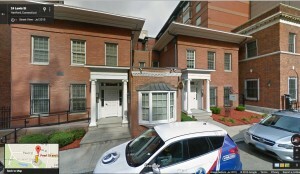 His papers were published in the 1970s, and his piece titled 27 Lewis Street is available at the Connecticut Historical Society. It is easy to envision Mitchell purchasing Palimpsest when one reads Soby’s description of Mitchell and the bookstore. The house in which the shop was located was one of several two-story brick houses built on the short street in the middle of the 19th century. It was a beguiling location in downtown Hartford and doubtless it had been chosen by Edwin Mitchell because it reminded him of places where bookshops were found in London, a city he revered. He stacked new books from the creaky floors to the high ceilings on the ground floor [ . . . ] and, later, a rare book room [ . . . ]. It’s always interesting to find out in what ways local lore plays into any given research project. For me, the most fun aspect of examining H.D.’s first novel was digging up information about the bookshop form whence it came. 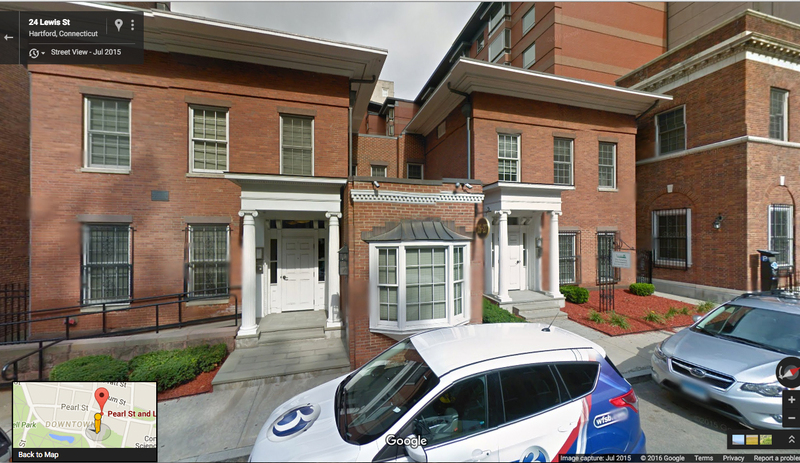 After viewing Mary Morris’s scrap book newspaper clippings and James Soby’s captivating piece about his time at the Mitchell bookshop with the help of the Connecticut Historical Society, and scoping out the property thanks to the convenience of Google Maps (see screenshot), I will certainly be walking past 27 Lewis Street next time I’m in downtown Hartford and imagining it full of old books one hundred years ago. You are currently browsing the I Found It at the Watkinson! blog archives for March, 2016.